I own two Game Gears, and I’m showing them both on this page. I really regret not having one of these when it was a current system, as I became a big fan once I purchased my first used model off Ebay. Sega had this on the market at about the same time as the Atari Lynx and the original Game Boy, and while it fails in some of the same areas as the Lynx (short battery life, too much heft), I think it’s a much more successful system overall and a worthy alternative to the Game Boy. 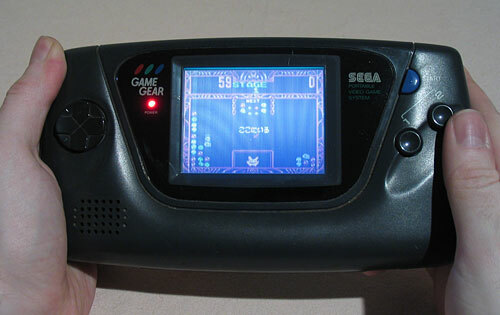 If you wanted portability and low cost, the Game Boy was your system – if you wanted power at any price, the Game Gear was perfect in its day. This is my second Game Gear, and it’s pretty beat up – it’s the one I use to actually play rather than keep sitting in a box. Yes, just like the similar pic on the Lynx page, this is pretty close to what playing games on this thing really looks like. (The moire effect is a camera artifact, but the color, brightness and contrast are pretty close.) Your eyes adjust to a certain extent, but not completely. One of the real problems is the screen’s viewing angle – you need to hold the system at about a 30 degree angle away from your eyes (in other words, so the system is not straight) to see any picture at all. To their credit, Sega did include a brightness knob (unlike Atari), but it doesn’t really help. But what saves the system for me is just its internal hardware, which directly affects the quality of the games. There are just some great games on this system, including the one shown above – Puyo Puyo 2. 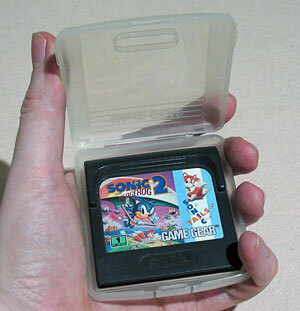 I need to get a Game Gear; I got my first Game Gear game last month (Sonic the Hedgehog 2, exactly like the one pictured, clamshell and all), and I’m itching to add the system to my collection, as well as more games. 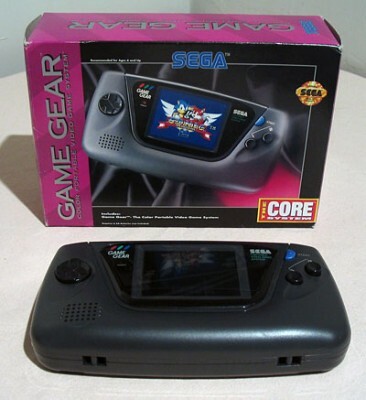 Hi, I am a huge fan of the Sega Game Gear, I have owned one since it’s launch in the UK in 1992. 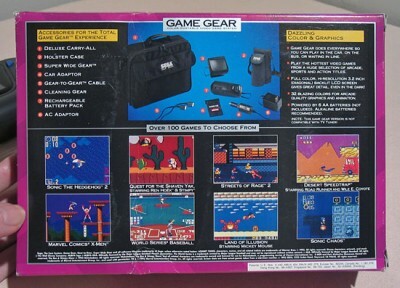 You can check out my Game Gear collection on my website http://dark-matter.110mb.com/ You have a great site and a great collection. Keep up the good work !